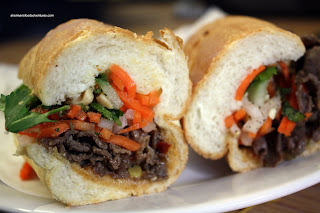 I'm always game for some Banh Mi. For me at least, it's the perfect snack food. Not quite large enough to be a full-sized sub sandwich; yet not too small that there is no substance to it. Yes, I do get it for a meal occasionally. However, I usually get at least 2 to make sure I am full. It's been months since I've had one and when I saw Ben's post on Ba Le on Kingsway, the Banh Mi cravings came to the forefront. You know, the urge to have crumbs scattered all over you from the crusty baguette. The urge to have your tongue burn from the hot peppers. 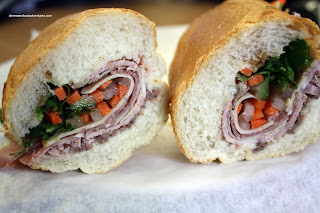 The urge to have pate and Vietnamese meats in one sandwich. Yes, those urges. If you've never had these urges, I "urge" you to try one for yourself. One problem. Since I work in North Delta, the chances of me finding a Banh Mi are not good. A good samosa yes, Banh Mi no. Wait. There's the Surrey location of Ba Le! But that's all the way in Guildford! Hey, it's only a 15 minute drive to the Guildford T&T (where it is located). Fine, that's it, when I have a craving, I need to satisfy myself or I'll totally space out. Case in point. In both softball and hockey, my teams are constantly frustrated when I start thinking about food prematurely prior to a game ending. When that happens, they know that it's a lost cause. Might as well throw the game, Sherman is useless. So, not trying to be a useless zombie for the rest of the afternoon, I headed over to Guildford on a quest for my Banh Mi. Well, either there was no traffic or I broke some speed laws because I made it out there in less than 15 minutes. The wait for the subs seemed to take longer. I ended up picking up 4 of them - 1 cold cut, 1 satay beef, 1 meatball and 1 grilled marinated pork. No, not all for me, I got some for Ma as well. Okay, either they didn't use fresh bread or something was amiss. Instead of the usually light, airy, crusty baguettes which Ba Le is known for, these were dense, chewy and hard. I'm hoping that this is a one time thing. It's too bad really since the meats and fillings were plentiful. I particularly liked the meatball sub the most. The cold cut was pretty standard with usual meats, pate, cucumber, pickled daikon and carrots, cilantro, hot peppers and fish sauce. Ma's satay beef was excellent, with plenty of meat, peanuts and the aforementioned fillings except for the pate. Oh cool, I didn't know they had a location in Surrey too. Regarding the bread, I found the same thing when I went to the Kingsway location a couple of weeks ago. I think this is because they've started making their own bread rather than ordering it from Empress Bakery. I'm hoping they're just trying to work out the kinks in the bread making process though because I really miss the light crunchiness of the old bread! Yah, I noticed their bread making oven there at the Kingsway location (that's my go-to location). I was wondering if there would be any differences in the bread. Maybe they'll work it all out soon. I once asked the owner's daughter (kingsway location)why this location's sandwiches are different and she mentioned that it was a franchise. They just supply the 'meat' and stuff and the rest is up to them. They also supply to Chinatown but they are related. Try the Wonton Noodles in the same food court. Shui Gow is also pretty good. $4.25 tax included. Not bad for the price. Just outside, Tasters Bakery has pretty good cream puffs. Don't get the flavoured ones though. Across the street, Akasaka. Yet to disappointed. Thanks for the info! Yah, the meats are exactly alike; but the bread was not. That explains everything. 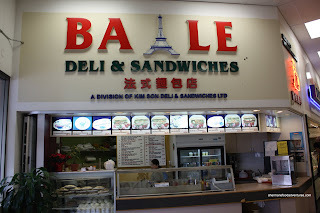 That also explains the "Division of Kim Bon Deli" below the Ba Le logo. Oh, yah, thanks for the tips too. Will definitely try those places out! I second Taster's. They are a good Chinese bakery. Also recommend the Japanese place in the T&T food court even though it is fast food, as it is Japanese owned. They have a daily bento special as well. Avoid the ramen there though. What the f?! Ba Le opened in Surrey!? I didn't know! A pretty decent little place just opened up here in South Surrey called BeanSprout.... a bubble tea and Vietnamese Sub shop that is quite nice with wonderful staff. 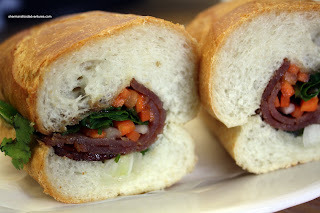 They are located at 3189 King George Highway, #14 Surrey, BC and they have the type of baguette I think you like (crispy and light). The chicken one is especially good. 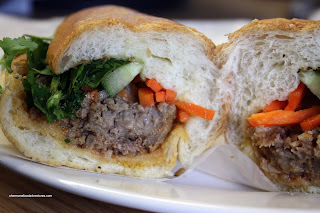 For the best kept bahn-mi secret in Surrey head to Heng Long market. There is a sandwich shop in the front which makes the best bahn-mi. It beats Ba Le, Viet-Sub, and Au Petit Cafe. The secret is to order the special sub. and another food blogger did a review.